I'm an online writer and car enthusiast with years of car maintenance experience. Were you ever stranded out in the night because of a flat tire and had to wait for hours for a repair truck to rescue you because you did not know how to change a flat tire on a car? Then, after they were finished, charged you a hefty sum? Wouldn't it be better if you could replace a tire yourself quickly and safely? Well, you can! In this article, I will discuss the tools and instructions needed to change your flat tire step by step. When changing tires one should be very careful, as anything can happen even though it might not be your fault. It is simply best to try to avoid these things from the beginning by taking the necessary precautions. 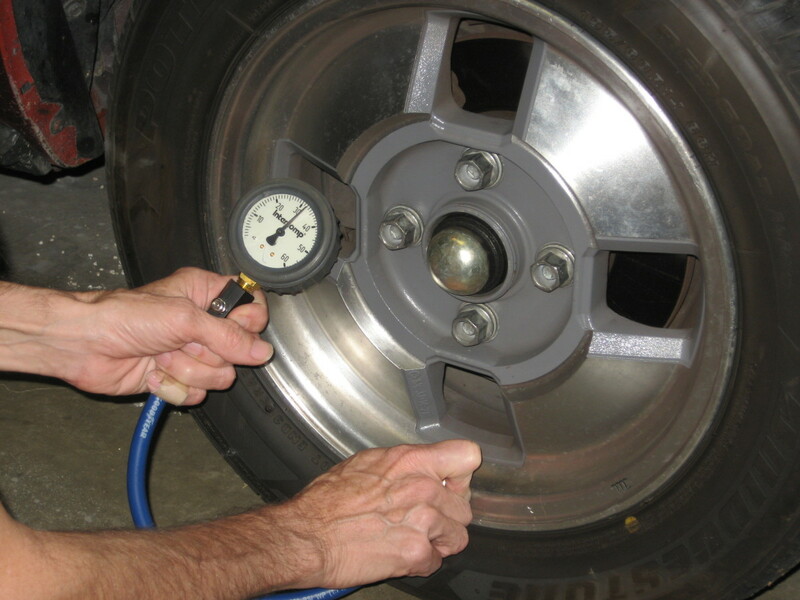 This and other tire changing safety tips I will explain in this article. So educate yourselves, read and enjoy! Of course the spare tire. A flat bit screwdriver or a utility blade. A reflective jacket and a reflective triangle or cone. Where do you find the equipment? These items should be kept in your car at all times. 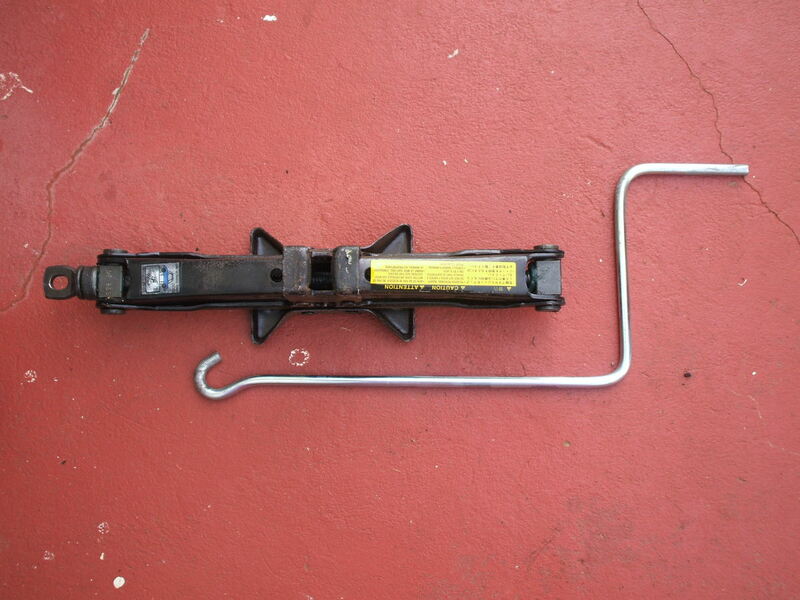 The wheel brace (the L or X-shaped tool that has a head shaped like a hexagon), the car jack and the spare tire are all found in the trunk under the padding or carpet (in jeeps sometimes the spare is on the outside of the back door). 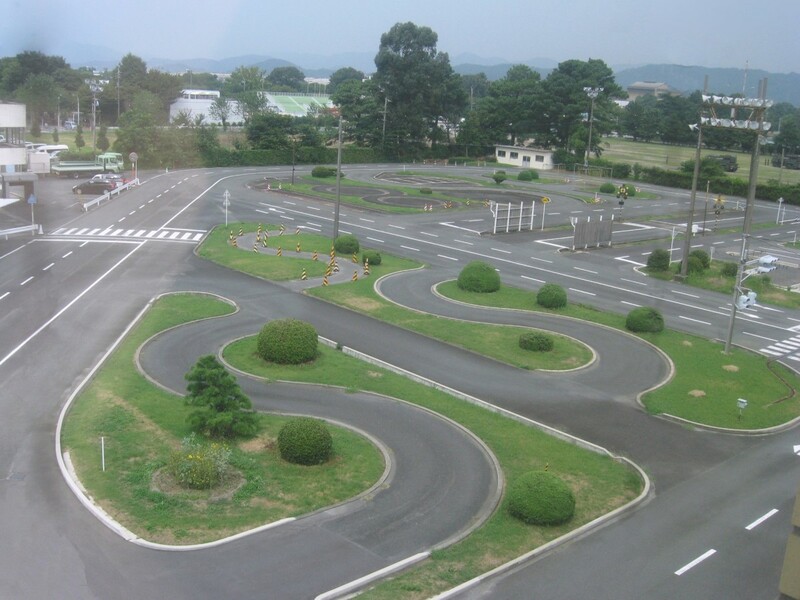 Firstly look for a level, flat and hard area. 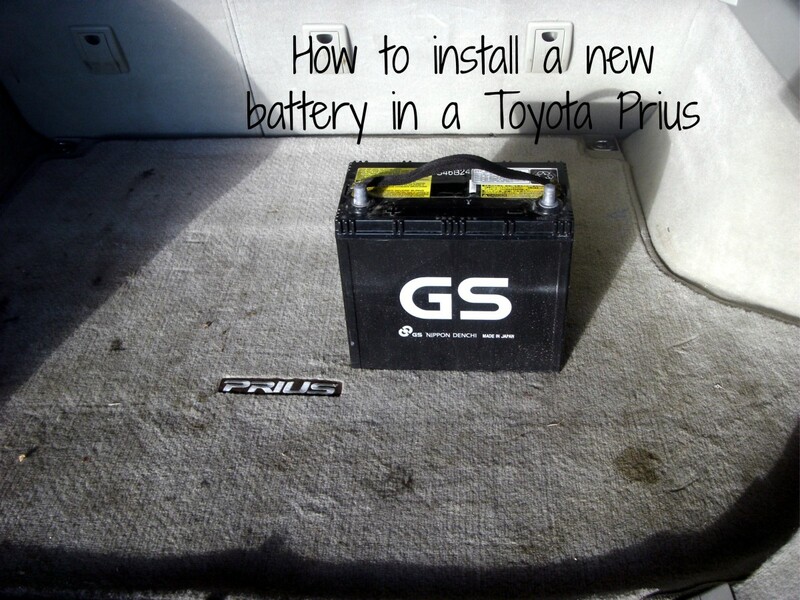 This is crucial because you don't want your car to start moving with your hands under it! If you are near a highway or on any road, move your vehicle as close to the side as possible by slowly pushing it (preferred) or driving it. This step is paramount. Imagine you are happily changing your tire when you hear the screeching sound of breaks and BAMM! Someone took it upon themselves to write you and your car off the road! Upon waking up, you find yourself in the hospital with relatives swarming all around. In a worse case scenario, you might not even get up! As far-fetched as this event may sound to some, it is the fate of some individuals who fail to properly remove their vehicle's from the road when performing vehicular maintenance. Also remember to turn on your hazard lights especially if it is dark. 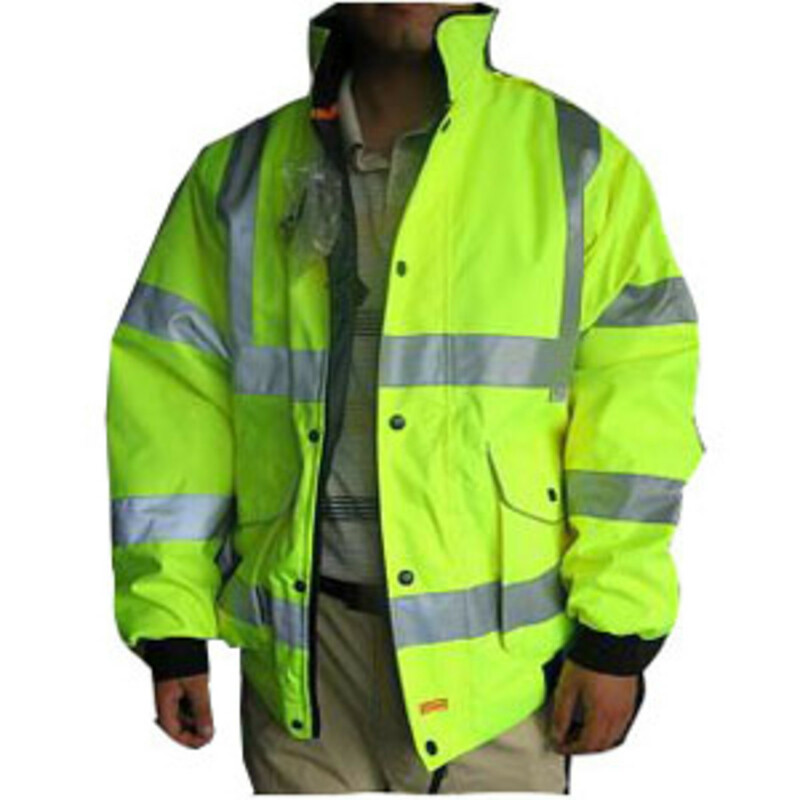 Put on a reflective jacket and place you reflective triangle or cone about 15 - 30 meters behind the car. 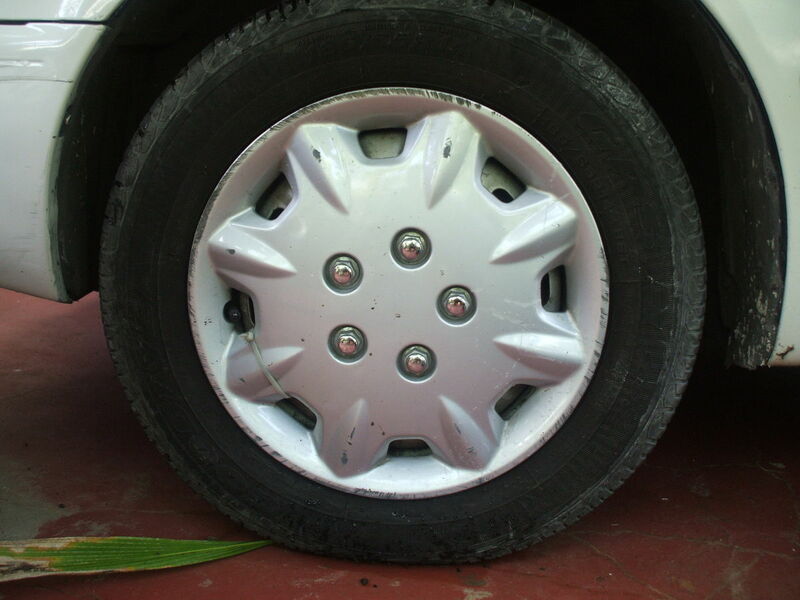 If the flattened tire is on the side of your vehicle which is facing the road, turn your vehicle to the opposite side. Do this because even though your car may be off the road, it is still possible that someone can lose control and hit your vehicle or worse, you! When changing a flat tire on a car, ALWAYS, remember to put your car in park or 1st gear, and also to pull the handbrake. As mentioned before, you don't want to give your car the decision to move while your hands are under it, as this can very easily break your hand! If you can find a cement block or any sizeable rock or even a piece of wood (you can keep this in your trunk), place it behind and in front the three good wheels. Put on your gloves since tires are filthy. Get your spare, and remember to place it flat on the ground to prevent it from rolling away. Next use the wheel brace to 'crack' all of the nuts. If your car has wheel caps (hubcaps), these can be easily removed even if cable ties secure them. Just cut the cable ties using a utility knife. Then, using a flat bit screwdriver or the same utility knife, push either of their edges into the side of the wheel caps and pop off the caps. Now the nuts will be exposed. Be sure to stand with a straight back and straight arms and to push the wheel brace in an anticlockwise direction. Try to keep the wheel brace parallel to the ground as sometimes only body weight is necessary to crack the nuts. Do not crack the middle nut, only the ones around it. Do not totally remove the nuts; only loosen them enough to allow them to be removed using only the fingers. Where to put the jack when changing a tire? Search your car for the 'jack spot.' 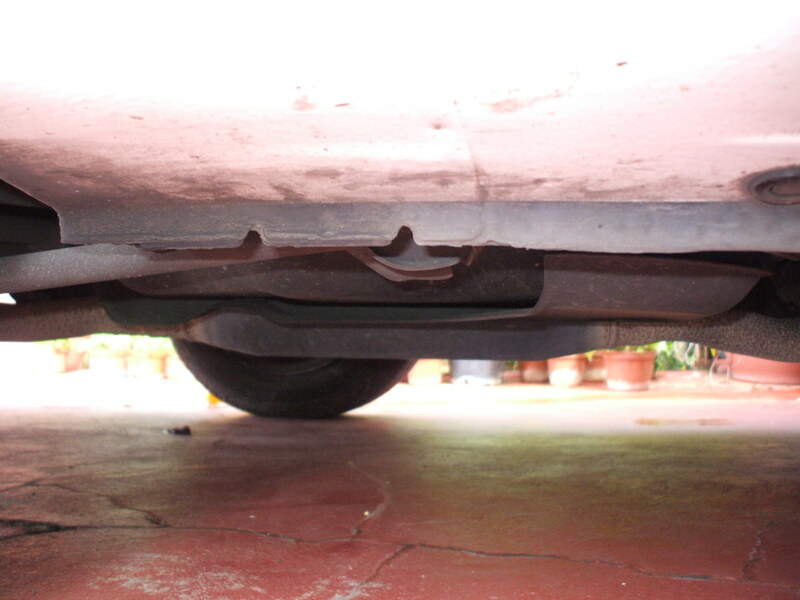 The spot is usually a hump or a pair of slots located on a reinforced metal beam under the car. It is found just behind the front wheel or in front of the rear wheel on both sides of the car. Look at the bottom or top of your jack for the exact location of the 'jack spot' and also for other instructions. Place the jack right side up, on a level surface, directly under this spot after you have acquired it. Crank until the 'jack spot' and the jack are fixed snugly together. Now its time to really start cranking! That is if you don't own an electric jack. Crank until the tire is about one inch off the ground. Any higher than this will cause the car to become unstable because of too much weight on the jack. If you are cranking and the jack isn't lifting the car off the ground even though it is fully extended, just place a flat piece of wood under the jack to provide more height. When finished jacking, remove the nuts totally from their bolts. In some cases the nuts are as long as bolts so don't be alarmed by this. Put the hardware in a place where it cannot get lost or roll away. Remove the tire by pulling it in the direction of the now exposed bolts. If your wheel used the long nuts, the wheel will come off when you remove the last nut. DO NOT twist or shake the wheel too roughly. If the wheel refuses to move, give it a good kick. But don't overdo it as this can bend the bolts or cause the jack to become unsteady! After removing the flat, place it under the car near the jack. If the jack fails, this tire will stop the car from dropping directly down onto its hub and damaging it. Before installing your spare, be aware that some spare tires contain readings on the inside. Remember to read these correctly as they can provide critical information, such as the maximum permissible speed and the bolt or nut type the spare was designed to be used. If the spare is the original one which came with the car, the bolts or nuts that came off of the flat can be reused. 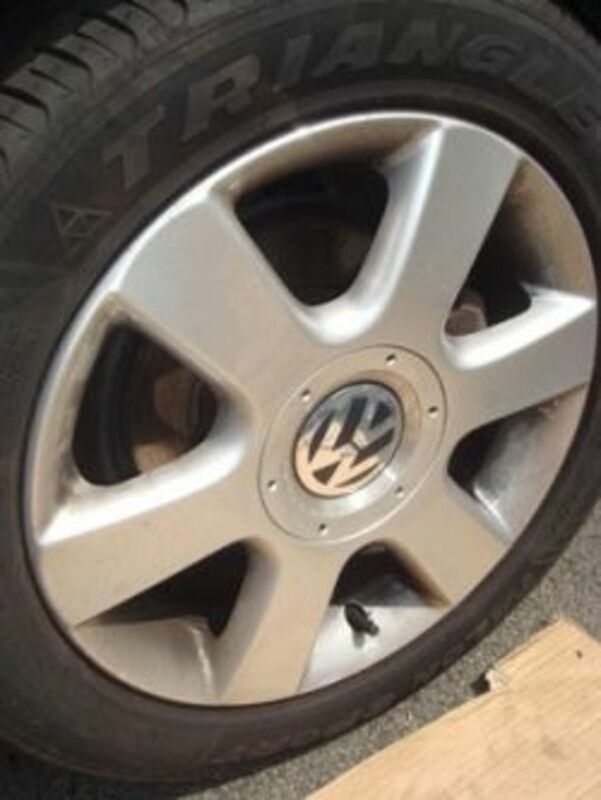 Line up the bolts or holes of the car hub with the holes located on the spare tire and push the wheel onto the hub. Finger-tighten the nuts in a clockwise direction onto the hub using the cat-and-corner method (this means to tighten the bolt that is furthest away from the first one tightened, or tighten one nut then the opposing nut). 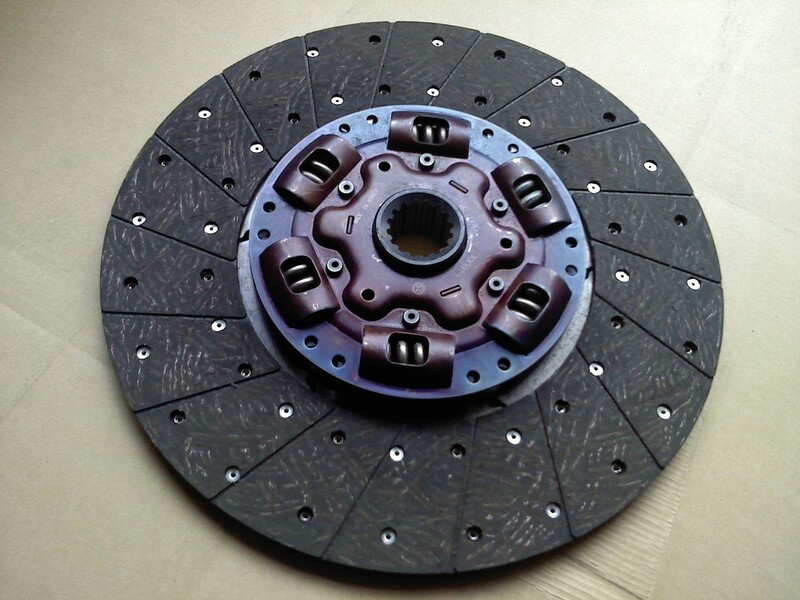 This is done to maintain even pressure across the wheel so that the wheel will be flush on the hub without any tension. When finished, remove the flat tire from under the car and unwind the jack (or press "release" on a hydraulic jack) to let down the jack until it can be removed. Use the wheel brace to fully tighten the nuts using the same 'cat and corner' method as mentioned above. 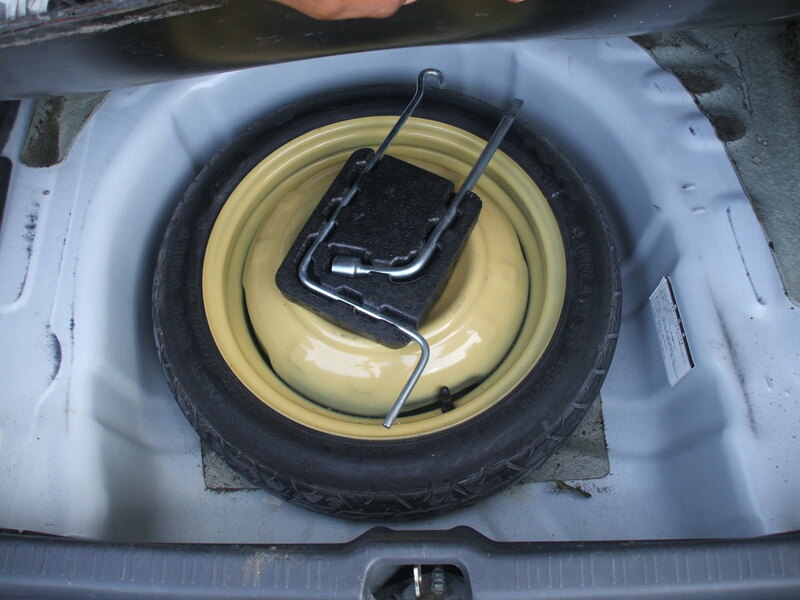 Place the flat in the trunk where the spare was taken from and replace all of the other items used. Drive to the nearest tire repair garage you can find to replace the flat tire, because you only have one spare! It is called a 'spare' for a reason, and should not to be used as often as an original tire. The spare most of the time it is not as strong, as the original tire, that is why limitations are placed on the spare tire! Therefore, get the flat patched or buy a new tire if you can afford it. Also get your other tires checked to see if they are worn down and need replacing. Do not wait until you get another flat. Remember we are trying to avoid changing a flat tire on the road because the tire changing process can be risky (remember our above illustration). If you chose to buy a new tire or wheel, take the flat to the nearest recycling facility. How to change a spare tire - Which comes first? Now you know how to change a tire on a car. Not sure if you can get all of the stuff listed here done in an emergency? Try it at home. Yip, practice removing and replacing you tire from in your garage step by step, remember to imply all safety methods listed above. I hope this article clearly explains the process of tire changing. If you have any questions, feel free to add a comment below. I think "getting to know your car" is an important step. Knowing exactly where the equipment is will make the process easier and less stressful. If you never even looked in your trunk it can be a bit intimidating. Many car, trucks, suvs are set up differently. Thanks for the comment Autoafricanado! Yip, its very important to put the jack on a level surface because we don't want the car crashing down on its hub or even us! Wow, I'm glad no one got hurt in what could have been a horrific incident! You've made some great points, easyguyevo! It was very informative and the pictures added great value, as they are helpful in sparking one's imagination. If you don't mind, I'd just like to emphasize one of your points that before using a jack make sure the car is on a level surface!!! I've witnessed a jack fail, due to it being improperly positioned on a slope. Luckily no one was under the car at the time! Thanks for the comment Linux Web Hosting. Yes, I always think safety first. Though some of the suggested tips listed above should be common sense some might still forget. I am very much impressed the way you have pointed out some very small mistakes which can not be taken so seriously but may cause for big damage to your life, in some cases may end your life also. @ onlinecashdigest, thanks for the comment. Glad to see you found the hub informative! Yes, the reflective jacket and triangle are very important, they can save lives! @ Denise Handlon thanks for the comment. Glad you found the hub useful! very informative....especially on the reflective jacket... definitely gonna need that one during night time. Simple instructions that are soooo useful. Thanks! Congrats on the hubnugget nomination. I'm checking out all of the hub topic nominations this weekend, so best of luck. Thanks for the comment. Yes I was looking for some information and those links were very useful. Thanks again! Congrats on your nomination. Good hub for those that want to change tires. Useful info for those that choose to attempt this feat. Congrats on being a nominee in this week's HubNuggets Wannabes contest. Good luck to you! Thank you Cagsil, glad you enjoyed the hub! I don't remember nominating this hub, infact I am not even sure what is Hubnugget Wannables! I will be sure to check up on it though. Maybe someone nominated it for me. Well, thanks to them!